Ready to fly? Don’t forget to select a seat at the time you are booking your flight. 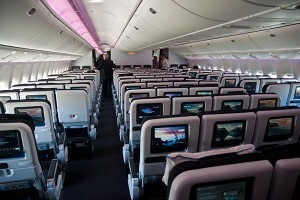 Many airlines offer their passengers to select a seat at the time they are booking a flight, either online or by phone. 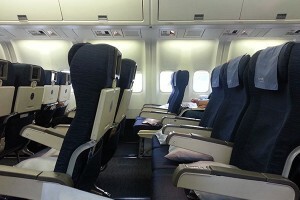 Getting your preferred seat on a very long international flight it can be critical for your overall flight experience. The most common seat arrangement are 3-3, 3-3-3, 3-4-3 and 2-4-2 (“-“ represents aisle). Passengers often try to have the window or the aisle seat and avoid the middle seat. We listed the pros and cons for both options. The view: You may get to see beautiful landscape, famous cities’ skyline, stars, lightning storms and different shapes of clouds. You can place a pillow on the window and lean on it. For some passengers, it feels more comfortable and easier to sleep. You will have nobody seating on at least one side next to you. You have access to the window shade to control the daylight. You will have to ask the person seating next to you to move so you can get up off your seat during the flight. Immediate access to the aisle. You won’t have to ask anyone to move when you need to go to the restroom, want to get something from the overhead luggage storage or just want to stretch out. You will have to move away if a passenger who’s seating next to you wants to get up off his seat. When the flight attendant is serving meals and drinks the tray or glass will invade your space which can lead to an accident. Although it’s rare, you wouldn’t want to take a chance of spending the rest of your flight wet by a spilled drink or covered by someone’s food. People walking in the aisle may trip over you. It’s annoying and can be painful when it happens, especially if you sleep and didn’t see it’s coming. Besides the seat being located next to a window or aisle, the other factor that makes a seat better or worse is the row location in the plane. The very first row of the economy class usually featured more leg room and considered a better row. Passengers seating in the front rows usually get their meals first and get to leave the plan before others, when arriving to their destination. If you choose the back rows, there is a good chance no one will be seating next to you on a non fully booked flight. If you book your flight online on the airline’s website, you may check how full is the flight. Keep in mind that it can always change later, especially if you are booking your flight long time before it’s scheduled. Emergency exit row seats have more leg room but be aware that not everyone allowed seat in these seats. Airlines require that a passenger sitting in these seats will be responsible to help other passengers in a case of an emergency. There is also an age restriction so if you travel with kids, they won’t be able to seat next to you in an emergency exit row. You should avoid choosing a seat close to the restroom if you don’t want people to stand next to you while waiting in line. A seat next to the bar or kitchen area can be a good choice if you often like grab a snack or a drink but can also be a disadvantage if you try to sleep and there is a noise of the metal drawers or the crew and passengers are eating and talking in that area. Other things to notice are some seats can’t positioned back, usually the seats in the row before the emergency exit row including the an emergency exit row before another emergency exit row. 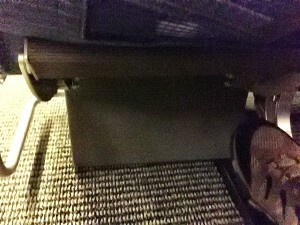 Some seats have equipment box underneath, making it impossible to stretch your legs if you seat on the seat behind. The airlines usually don’t mark the location of these boxes on their seat map. Some planes feature power ports where you can plug and charge electronic devices. New planes have USB or power socket for standard plugs in all seats. However old plans may only have them for some of the seats. If you plan to use your electronic device during the flight, make sure to select a seat with a power port. How much does it cost to preselect a seat? Some airlines offer their passengers to preselect their seat for no additional cost, while other airlines allow it only for members in their frequent flier program. Many airlines charge a fee for preselecting any seat or seat that considered more comfortable such as seats in the emergency exit row. There are also airlines that don’t provide the option to select a seat at all, for a fee or without it. You can view seat maps of different planes by the plane model, the airline or the flight number on the the airline’s website. Remember that the seat map is not always accurate. Some airlines have plans of the same model with a different seat arrangement. The airline can also assign a different plane for the flight, short time before boarding. Preselecting a seat gives your better chance to control the comfort and the overall experience of your flight. What is not under your control is deciding who seats around you, especially when you travel alone. Crying babies or a passenger with bad behavior/habits seating next to you, can turn your flight into a nightmare, but this is another story that will be covered in another article. We would like to hear your preference. Comment below and tell us what is your preferred seat?